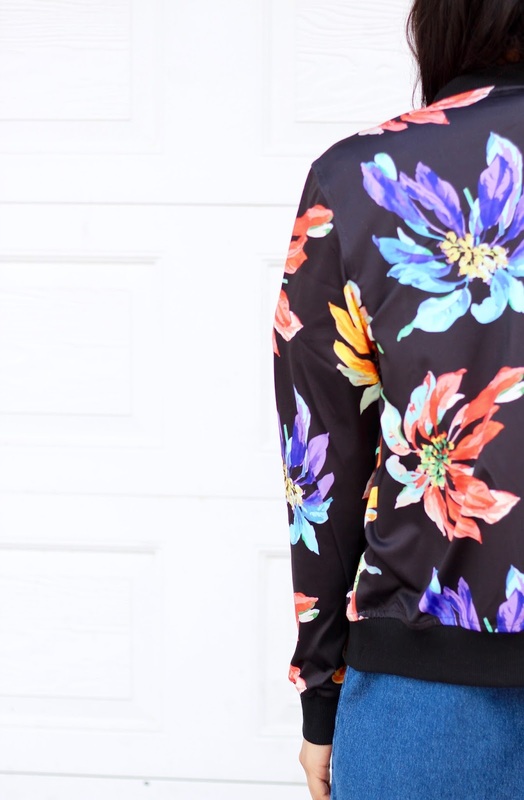 floral bomber jacket c/o sheinstyle - it's on sale right now!! I don't know about other parts of the world, but here in Vancouver the weather is most certainly unpredictable. This is why as a true Vancouverite I always carry an umbrella, even on the hottest of days. So it's always been a no brainer living here and so close to water that the evenings get chillier. That always meant that if you planned to be out the whole day that you would need to carry a light jacket with you. And if you are up to date on your recent fashion trends then you'll know that bomber jackets are the new popular outerwear item. I had been on the hunt for one for a while and finally came across this fun version with a great floral print as I find that I wear too much black, even in the summer months and wanted that to change! Another thing I did for the summer was buy myself a trendy pair of sunglasses. I find that when it's hot I almost never want to wear makeup so sunglasses are good way to hide my dark circles and bags (yes Ive been blessed with both--double whammy!). But wearing a trendy pair of sunglasses can also up your outfit in terms of making it more fashionable. I found these glasses at an ABC store in Hawaii. Now, if you have ever been to or are from Hawaii then you would know that these ABC stores are everywhere in Waikiki and they are full of everything from food, produce, towels, accessories, souvenirs etc. Its a one-stop shop full of tourists and for tourists. Believe me it had everything you could possibly think of. So I was quite happy with the fact that I had found a pair closely resembling something I had searched Forever 21, H&M and Topshop for for months! I have found a new found confidence and its translated in all sorts of fun co-ords. Now, I know I haven't featured any in any of my outfit posts this summer, but Im sure they'll make their way soon enough. I love those crop top-short or crop-top skirt co-ords and even though a good co-ord that is reasonably priced and actually have both the top and the bottom fit you properly are hard to find I have splurged on 3. They're fun, they're put together, they're so summer. I have forgotten about shirts that go past my belly button...seriously I am in love with crop tops. fitted, loose, long-sleeve, t-shirt, printed, basic or halter. I want to catch them all, like pokemon. I wear them with skirts, tailored trousers, slouchy trousers, high-waisted pants...basically everything. It's a good trend, I like it, I hope it stays for a while. As a kid born in the late 80's I remember the choker trend so well. Their reoccurrence in the fashion scene isn't a surprise to me, I just wish I had kept some of my chokers from back in the day. But any which way this is one jewellery trend I have gotten behind. Layering necklaces has never been more fun. I have thin lips. This means that at first I was apprehensive about the dark lips trend that started a few years back (thanks Kylie). But I can say that with a lot of experimentation I have realized it's all about finding the right dark shade that works for you. My personal favourite? Tulle by Colourpop! Another thing from childhood thats made a mean return are those platforms. I LOVE PLATFORMS! It's not because they make me taller (I'm already basically 5'9") but I just love them in a purely design sense. They're things of beauty and add a whole other dimension to your outfit...on the other hand Im still not too sure about the slip-on sandals with socks trend....maybe it's because I grew up playing a lot of sports and around a lot of athletes so I cant make myself think of this as anything but athletic wear and very far from high-fashion...but who knows! Dress: Forever 21- similar - on sale! First of all, you look great! Second of all, It's great to find a fellow Vancouver blogger! Vancouver can seriously be hard to dress for, I also always have an umbrella in my purse because you never know! 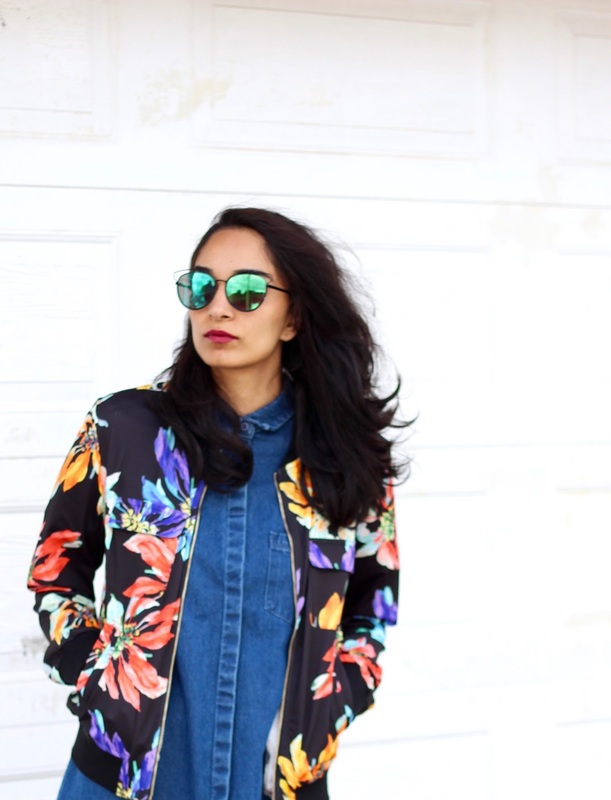 Loving the combo so much D: Such a nice bomber jacket to go with that denim shift dress!